War does what it needs to. It kills. It disrupts. It ruins and maims. And it earns a good dividend for shareholders who think their continued wealthy existence depends on the profit of the war industry. While the official definition of a state of war is becoming ever more opaque before legal watering downs such as “armed conflict”, the money being earned is getting clearer than ever. If you are in the death business and its various offshoots, you are doing spectacularly well with the noisy trading and the even noisier consequences. Such behaviour goes to show that a fall in military spending does not necessarily equate to a fall in the business of arming. 2012 was the first year since 1998 that global military spending actually fell, but that did not stop the 100 largest arms producers and contractors recording $395 billion in sales. The dip was explained by the Stockholm International Peace Research Institute as a lull occasioned by the withdrawal of US troops from Afghanistan. Those figures have certainly changed with the broadening of conflict in Ukraine and the Middle East. Ablin’s response is the fetishist’s hope that his product is bound to go further than it can. Forget the human element, and embrace the machine-like logic of destruction. “To the extent that we can shift away from relying on troops and rely more heavily on equipment – that could present and opportunity.” Humans, after all, just get in the way. The log book of slaughterhouse inventiveness has thrilled the arms suppliers globally, but also traditional suppliers in countries who tend to get rather moral when it comes to violence in other theatres. The most sanctimonious of all, the United States, is doing rather well for itself, thank you. The dark voice of the trading scene and death dealer Lockheed was rolling in it. It remains the world’s biggest defence company, and its existence is based on the most obvious point: it keeps having customers. On September 19, the price of its shares reached totals of $180.74. Huffing their way along the trail of dividends and death were good companions Raytheon Co. and General Dynamics Corp.
Others also profit on presumption and fear. Troop movements of an enemy state, or at least one not exactly in your good books, need monitoring. Machinery sales connected with that are doing well – keeping an eye on those naughty Russians is bound to keep some pockets heavy with purchase, the delectable spin-offs. Previous attempts have been made in the fast disappearing mists of history that made the war profiteer the ultimate criminal, an uncomfortable mix of snake oil merchant and rapacious seducer. Governments would be wooed into purchasing weapons for some future date of mass lethality, and the only one to really gain from it would be the arms seller. Contingency here is everything – but the point is that anyone who has such weapons is bound to, as Anton Chekhov so effectively reminds us, use it. Why load a gun if it isn’t going to go off? For all its fixations on finding links and conscious efforts as to what lured the United States into the First World War, the angry deliberations of the Committee of Senator Gerald Nye remain important. The focus of the seven-member munitions Committee, chaired by the North Dakota Senator, was ostensibly to examine the roles played by various groups that purportedly manoeuvred the Wilson administration into declaring war on the Germany in April 1917. While much of this was imputed motive, Nye was very much on the money when it came to the profiteers. 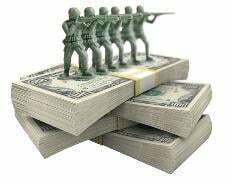 Modern forms of the defence contracting industry see instances of corruption, and manipulation of government contracts. As Samuel Perlo-Freeman of the SIPRI Programme on Military Expenditure and Arms Production explains, “The arms industry has always been associated with corruption both in international arms transfers and sometimes in domestic procurement.” Arms dealers are the desperadoes of dubious deals. Arms dealers, whatever fabulous public relations outfit comes to the rescue, are in the business of killing. They do not facilitate daily living in all its ordinariness, but the taking of life. Those who invest in them are in the business of investing in war, which should not be seen as some anthropological release for antsy upstarts. Good for the personal dividend; very bad for the durability and peace of human life.